Since 1958, Soil Testing has been performing subsurface investigations, test borings and foundation repairs. Our experienced drilling contractors gather subsurface information to construct and design foundation and find a solution to your foundation problems. We install test borings and piles to repair and provide foundation settlement. 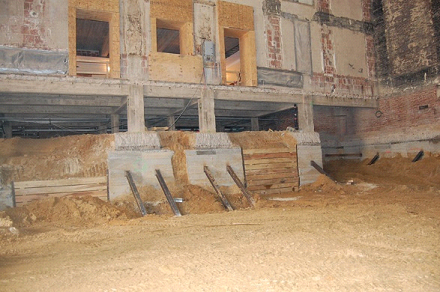 Many of our projects include underground construction for building foundation investigation in CT. We conduct foundation settlement using underpinning methods to settle foundation. Our work includes areas from residential and commercial to industrial structures. We are able to use new technology to go through weak soil to get the ideal foundation. Helical piles are what we use for added support to new or already existing foundations. They are installed deep into the foundation, and require a low to moderate pile capacity. They are commonly used for anchors and tiebacks, and the piles are made from steel. There are no vibrations that are generated from helical piles, so they are a quieter option. Another benefit to them is that they can have a minimum of 6 feet of space above the pile when installed. Helical piles are more cost effective than micropiles. Micropiles are high capacity but smaller than helical piles, and are used to support new and old foundations. They are made from steel, grout or threaded bar, and when installed create friction between the rock. They can be installed with a minimum of 8 feet of space above the pile, however they generate vibrations underground. Although the vibrations created are minimal, they are still louder than the helical piles. Before you dig, a soil testing evaluation should be done by a licensed professional. The soil investigation engineers are in charge of drilling a 4” to 6” pipe into the soil, and taking a sample. That sample will be sent out to a lab to understand your soil’s property cna capacities at every level. With this knowledge, our engineers will be able to determine how deep the soil should be for the foundation, where the strong soil is on the property, the type of foundation to be used, and the size of the specialized foundation. Each foundation is unique to each of our customers, which is why we need invasive technology. So contact us today to request a quote for your future foundation project. We are able to use new technology to achieve the ideal foundation that you desire.